A simple, but effective low maintenance front yard with shrubs and trees. Trees provide shade in the summer, but can stand as sculptures in the sunshine through the winter months. This small bridge provides a walkway over a dry river bed in the summer. 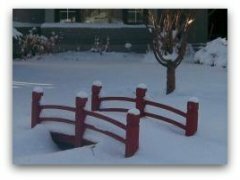 Small structures like these often create interesting winter scenes. 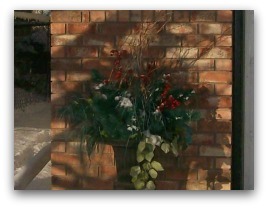 Convert your summer planters for outdoor Christmas decorating. 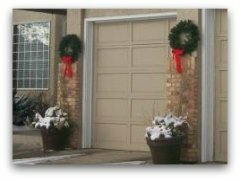 They can also compliment other outdoor Christmas decorations like these traditional wreaths. 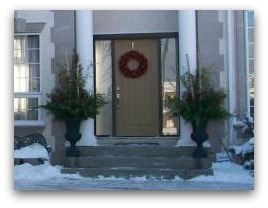 More traditional wreaths warm the entrance to this home. The red bow adds a nice touch to the small wreath by the garage. 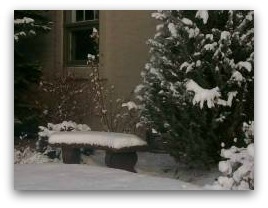 The front garden shrubs compliment the seasonal decorations covered with a fresh snowfall. 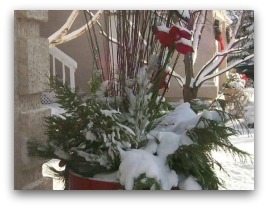 During the winter months and Christmas season, these planters are replaced with a more seasonal arrangement. They make this front entrance more warm and welcoming. Inflatable snowmen are a very popular item in recent years. 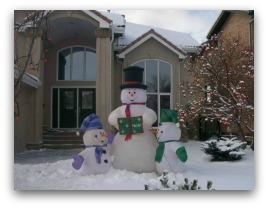 This snowman picture of Frosty and his kids are right at home, with an early snow for Christmas. 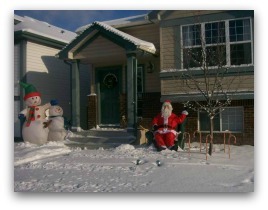 Another picture of snowmen decorating a front yard. This mechanical Santa waves to the kids as they pass by. 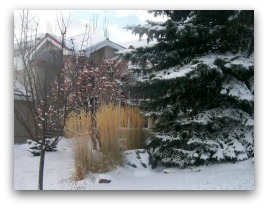 Ornamental grasses give life to a yard blanketed in snow. They also add contrasting colour to surrounding evergreen and spruce growth. 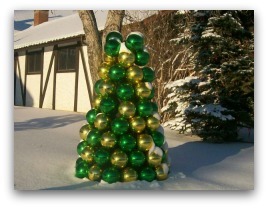 A small tree made out of ornamental Christmas balls stands prominent in this snowy winter scene. Driving around local streets can provide us with some great ideas for our own yards. Picture compliments of a dreamyard. Arrangements like this using flowerpots, are a great traditional way to decorate your frontyard. More people in northern climates are involved in Christmascaping than ever before. Another example of Christmascaping to soften a wall and provide colour. The effect of the sun and shade also adds interest to this well arranged planter. 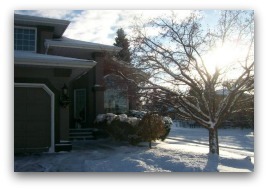 A small frontyard, designed for all seasons. 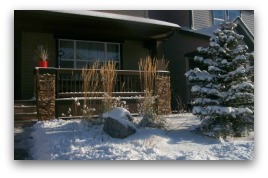 Ornamental grasses and the feature boulders provide year round interest. After the blanket of snow is gone, this well designed front yard comes to life with colour. Seasonal decorating doesn't have to involve a lot of time or energy. 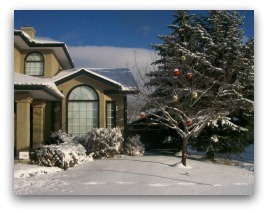 This homeowner uses large decorative Christmas bulbs effectively for a simple, but more traditional look. 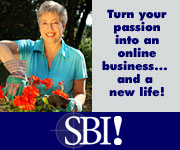 Outdoor decorating and designing is all about your sense of style. Features like this stone bench can also look good year round. 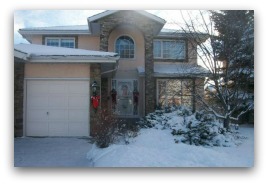 Covered under a snow, it still has a presence to give the side of this house some interest. 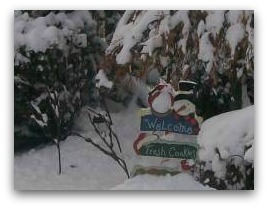 This snowman picture caught our attention as he holds this welcome sign. It is one of those simple, but quaint things that give so much character to this winter garden. We didn't get to try the fresh cookies though.